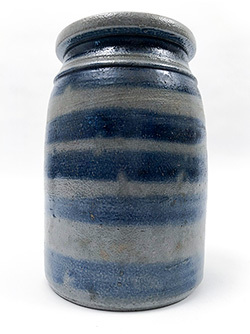 Circa 1880: This wonderfully thrown little semi-ovoid cream jar has beautiful lines and tastefully simple cobalt decoration. 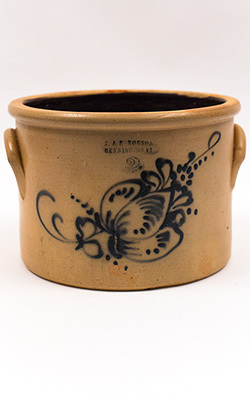 Condition is excellent on this attractive one gallon Ohio or Pennsylvania cream crock. 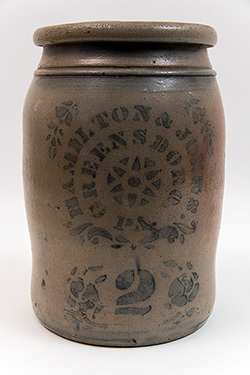 Circa 1850: This stamped 3 semi-ovoid 14" storage jar shows attributes from both Baltimore and Philadelphia but was probably made in Baltimore during the 1850s. 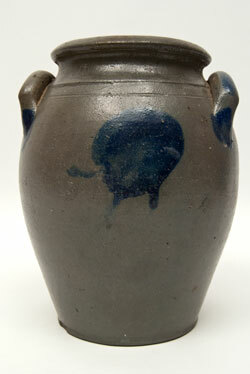 Condition is excellent with only minor flaking on the top and bottom rims of the jar—no cracks or repairs. 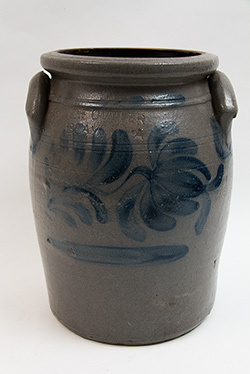 The large size of this handsome jar and its dark cobalt hand painted floral decoration will make it stand out in any collection of quality stoneware or early American antiques. 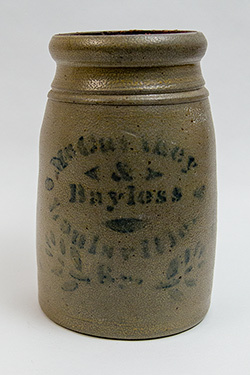 Circa 1880s: This 8" McCarthy & Bayless Lousiville, Kentucky, half gallon wax sealer is a real teat. 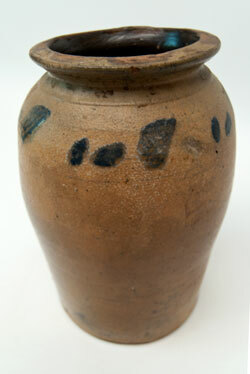 Other than some typical chipping on the inside lip, this great Kentucky jar has no other chips, cracks, or repairs. 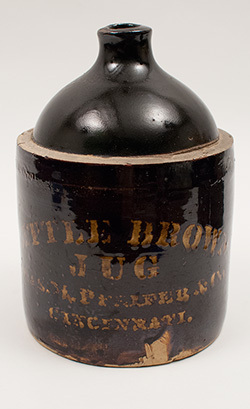 19th century Kentucky stoneware is in great demand, and this small wax sealer is sure to please. Circa 1880s: A.P. 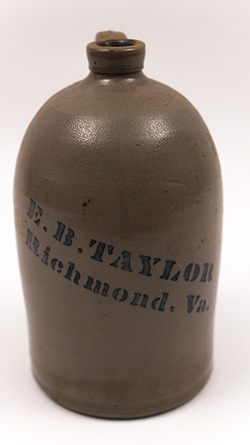 Donaghho, West Virginia's premier potter, made this rare 1/2 gallon 9 1/2" jug for Richmond VA merchant E.B. Taylor. Conditon is excellent with only a single minute flake on the lip. Jugs of this size, especially in this fine condition with a good, clear cobalt signature, are very hard to find and are extremely desirable by collectors who love diminutive pieces for the simple reason that they take up less shelf space than their hefty counterparts. 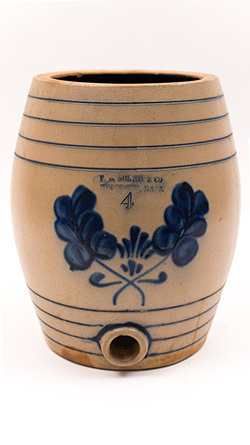 Circa 1860-1880: Bold and rich freehand and stencil cobalt blue decoration define this nicely propotioned 16" tall four gallon James Hamilton and Company churn. Exuberant stripes adorn the base and rim, with thick spins of the brush around each handle and a few dots for good luck on the handle tops. 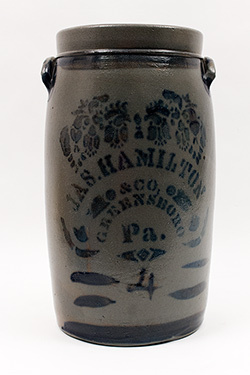 The front stencil is well done, with the thick, rich, bold blue that advanced collectors desire in Pennsylvania stoneware. 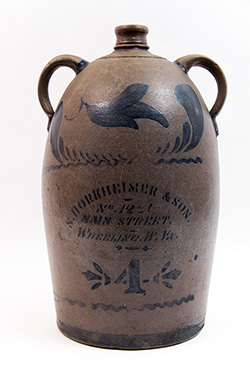 Circa 1880s: Double handled West Virginia merchant jugs are rare and desirable, and this spectacular S. Horkheimer and Son four gallon jug from Wheeling will put a smile on even the most advanced Pennsylvania and West Virginia stoneware collector's face. Simon Horkheimer and his son Myer ran a general store together in Wheeling in the 1880s until Simon's death in 1889. 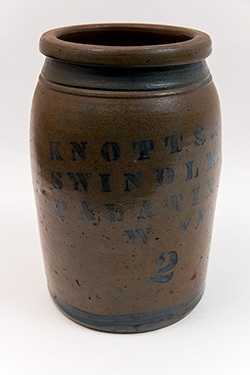 Circa 1870s: We love the large block lettering and slightly of center two gallon capacity mark on this neat salt glazed storage jar manufactured by the Palatine, West Virginia, pottery firm Knotts and Swindler. 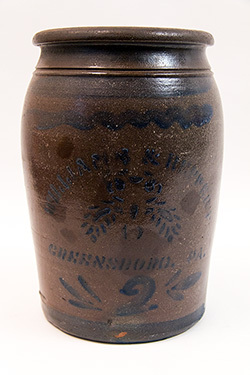 Circa 1860-1880: This one gallon blue decorated stoneware cake crock with original lid is attributed to Philadelphia's Richard Remmey. 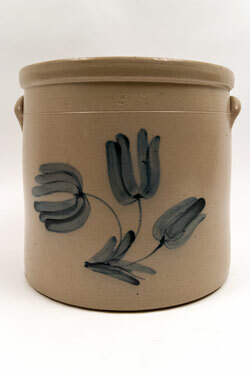 Floral decoration circles the entire crock, and there are cobalt brush strokes between the handles, a common feature on Remmey stoneware. A one gallon capacity stamp is located between one of the handles. Circa 1840-1850: 10" N. Clark & Co., Rochester, New York, nice size and ovoid form with wide band collar and applied strap handles and brilliant cobalt decoration.Please note minor base and rim chip, otherwise no restoration, cracks or damage. 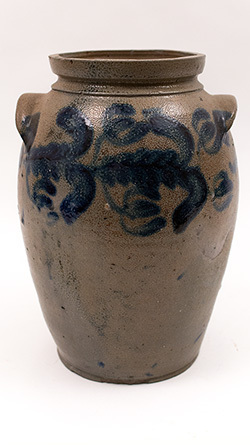 N. Clark was one of the most prolific potters in New York and this lovely piece boasts great brilliant cobalt decoration in bold, enthusiatic strokes. 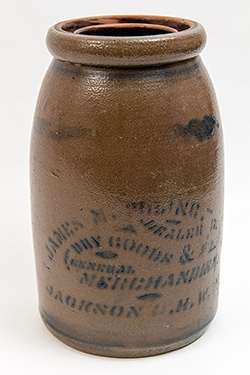 Circa 1880s: This 10 1/2" tall one gallon merchant jar from James Poling's general store in Jackson Court House, West Virginia, is a tough one to find. Jackson Court House was changed simply to Jackson in 1893 (then to Ripley later in the decade); so this town name no longer exists. This is an extremely clean wax sealer with only a super minor typical nick or two on the inside rim. 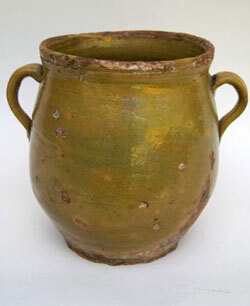 West Virginia stoneware collectors will delight in this great piece of 19th century Jackson County history. SOLD to the Poling family! 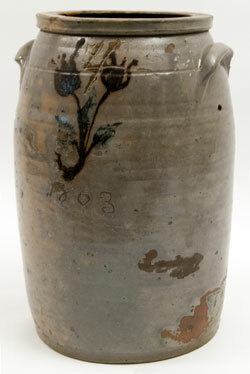 Circa 1870s: Character abounds in this highly decorated Richard Remmey blue decorated, salt glazed, antique water cooler. Here is use history to the max and one can only begin to picture the thirsts that were quenched around this 19th century water cooler. 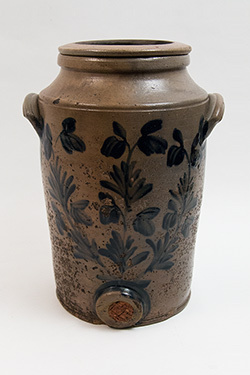 Circa 1880s: Potted, decorated, and kiln fired in Cannelton, Indiana, this scarce one gallon Ohio merchant jug was brushed with dark chocolate brown Albany slip and stenciled with Cannelton's signature mustard slip decoration. Chas. 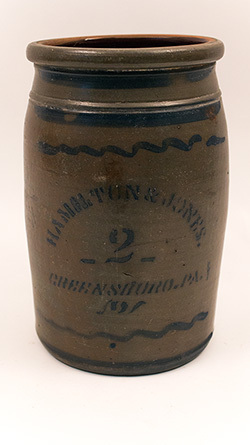 M. Pfeifer & Co. was in business in Cincinnati from 1882 until 1916 and specialized in wholesale whiskey sales with such brands as Billy Baxter's Best, Estil Springs, Three Owls, XXXX Golden Rye, and Yellow Label. 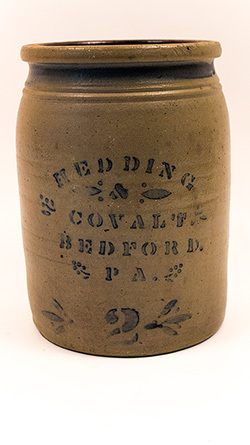 Circa 1880s: Here is a scarce and hard to find two gallon merchant jar from Bedford, Pennsylvania merchants Hedding and Covalt. 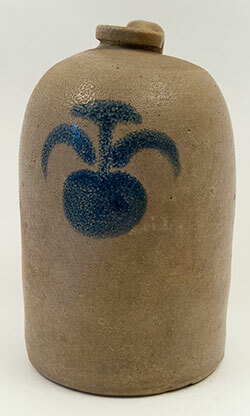 This piece of blue decorated stoneware has good, clear cobalt stencil decoration that covers its field from top to bottom. Condition is excellent -- no, chips, cracks, or repairs. We have seen a few one gallon jars from Hedding & Covalt find their way to the open market, but this is the first time we have seen a two gallon example from this merchant. 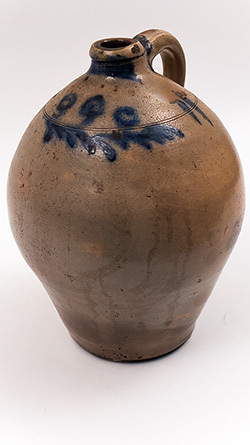 Circa 1830s: Standing 11 1/2" in height, this early, marked D. Albright blue decorated stoneware jar from Ohio has excellent form and wonderful character. 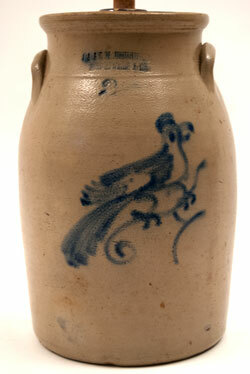 Circa 1880s: Half gallon, 8" tall, blue stencil decorated small stoneware jar from Palatine West Virginia. 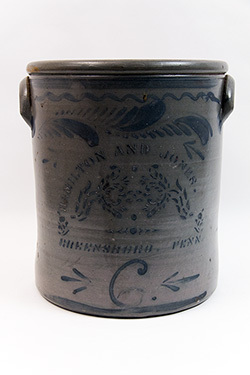 Circa 1850s: Standing 14 1/2" in height, this meaty four gallon storage jar was maufactured by John Weaver of Beaver County, Pennsylvania. 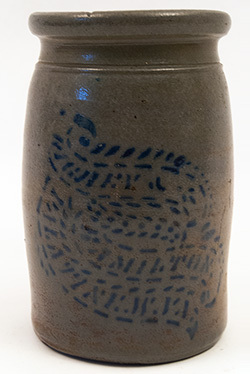 Stoneware manufactured in Beaver County is often boldly decorated, and this handsome jar's cobalt design, which approximates grapevines, is a stunning and imaginative example of the work done by the decorators at Mr. Weaver's pottery works. 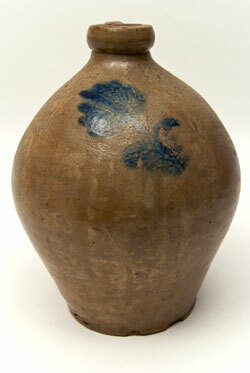 One should note that Weaver's stoneware is extremely shiny. 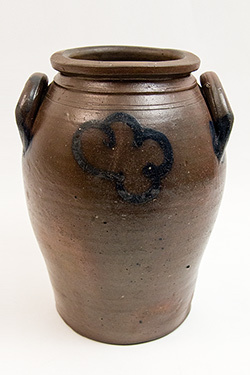 This is because decorators in this shop -- and elsewhere in Beaver County, to be sure -- first covered the stoneware with a gray slip as to mask the dull red clay of the region before they brushed cobalt onto the pieces and fired them in the kiln. 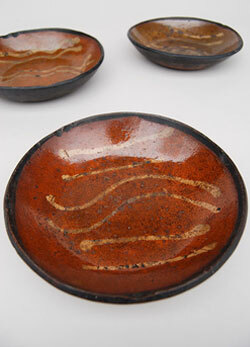 In other words, there are two layers of slip on Weaver's salt-glazed pottery, and this process made the stoneware more attractive and thus more marketable in its day. 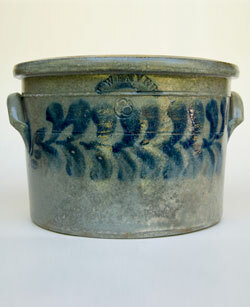 Circa 1880s: Decorated stoneware churns are always desirable, and this large 18 1/2" six gallon Hamilton & Jones butter churn with profuse freehand and stenciled cobalt blue decoration surely fits the bill. 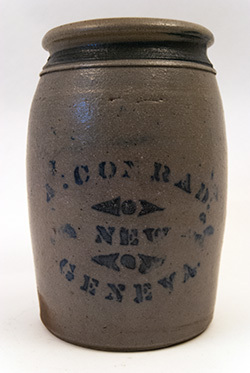 Circa 1840: Here is a meaty three gallon 12 1/2" tall ovoid storage jar with floral cobalt blue decoration manufactured by Cortland, New York's Chollar, Darby & Company. 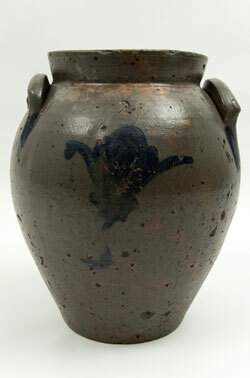 this jar has no cracks or reapair and only a few minor flakes around the rim which do not detract from its appearance. 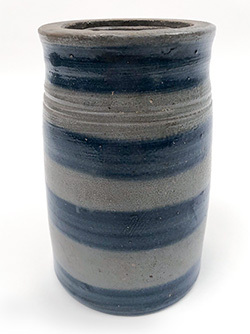 The large handles are extremely well-made, and the extreme ovoid form of the jar will make it pop in a collection of antique American stoneware and fine country primitive antiques. Classic Norton Oak Leaf Decoration: The Norton family contains one of the most famous lines of American potters, and their production spans over a century. 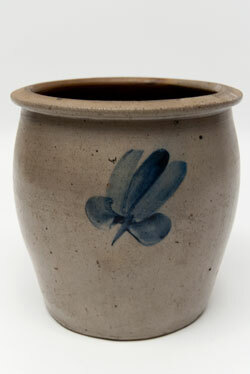 This is an uncommon form with lots of dark blue hand painted decoration from Worcester's most famous potter, Frank Norton. 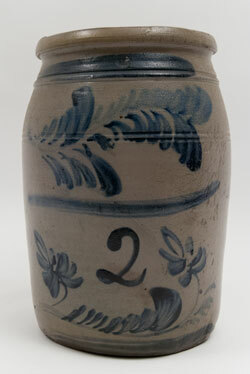 Circa 1850s: Here is a wonderful 10" one gallon lidded ovoid storage jar with whimsical bold cobalt blue freehand decoration. 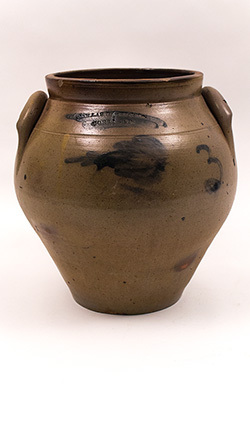 When longtime Indiana stoneware expert Dr. Anthony Charles Stringfellow examined this jar, he immediately informed us that it is most probably from Annapolis, Indiana. "When you see a roomful of these pieces together," he commented, "you can tell by the ears and the clay that they are from Annapolis." 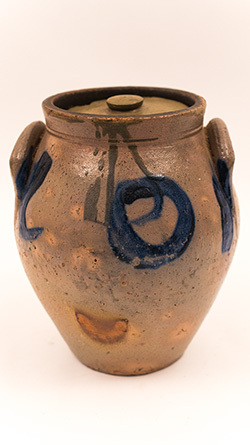 Of course, we have never had the opportunity to view an entire collection of Annapolis, Indiana, stoneware as even a single piece is rare to find on the open market; so we are selling this jar as an early Midwestern (Indiana or Ohio) blue decorated one gallon ovoid storage jar. 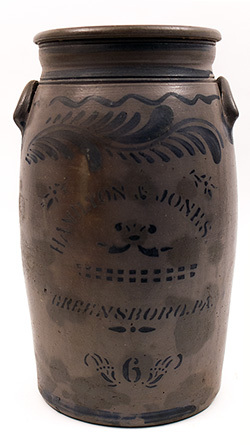 Circa 1830s: Thomas Crafts of Whately, Massachusetts, began manufacturing stoneware in 1833 after a long stint in the pottery business. 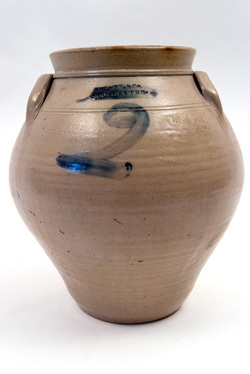 This well-turned 11 1/2" one gallon ovoid jug has no chips, cracks, or repairs, and has cobalt slip rubbed across its maker's stamp. 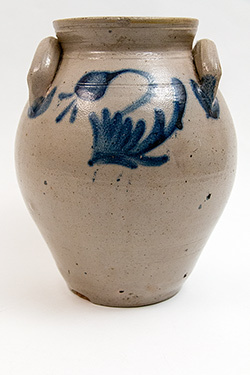 This example of Whatley's exemplary craft exhibits the simple ovoid form at its finest. Wheeling, West Virginia, Merchant Jar: We have not seen another example of this rare 15" tall five gallon Wheeling WV McMechen's Old Virginia Pickles jar as most of these Bristol glazed stoneware pickle jars were made for folks in the Midwestern states of Ohio, Indiana, Illinois, and Missouri. 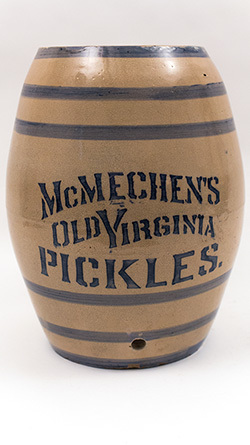 This large and extremely scarce pickle jar is a certain fit for collectors of West Virginia advertishing stoneware and collectors of country general store items. 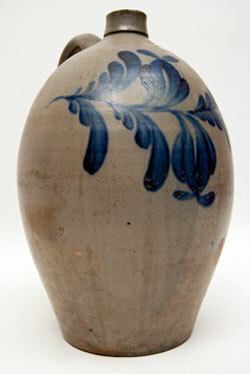 Circa 1850s: Wide swaths of freehand cobalt blue floral decoration populate the pleasing lines of this semi-ovoid salt glazed western Pennsylvania Beaver County two gallon storage jar. 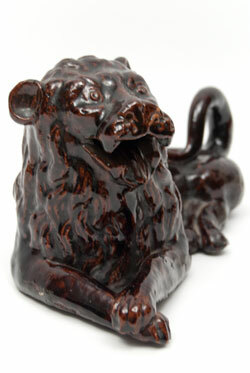 Beaver County stoneware is known for its bold and primitive decor against the region's dark clay, and this wonderful antique crock bears the classic attributes of its county's pre Civil War pottery. 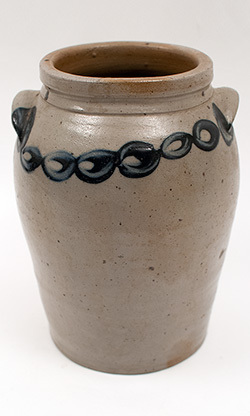 Decorated on front and back, this primitively elegant two gallon jar will hold its own among any fine collection of early American country wares. 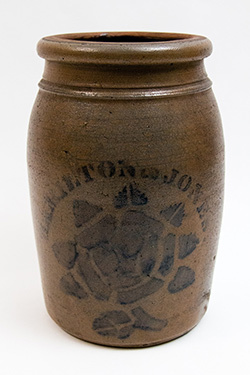 Circa 1850s: The J & E Norton mark was used 1850-1859 when Julius and Edward Norton ran the family pottery in Bennington VT. 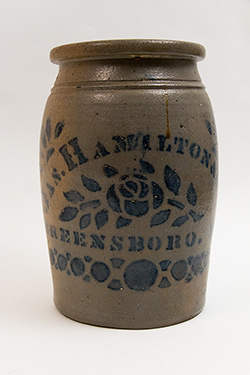 This rare two gallon cake crock stands just over 7 1/2" tall has no chips, cracks, or repairs, and is decorated over most of its field with the traditional Norton cobalt floral spray. This piece probably never had a lid and was meant to have cheese cloth stretched over its lip and tied off with twine. 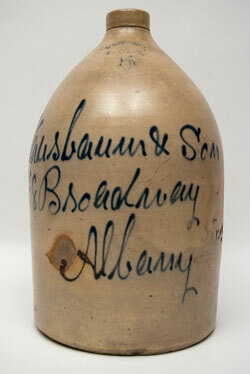 This is a scarce and interesting form from one of the premier 19th century American families of potters. 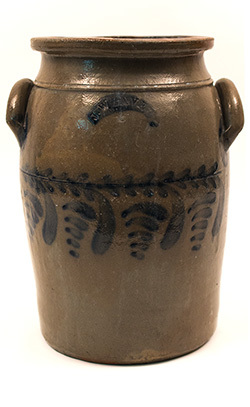 Circa 1880s: Potted, decorated, and kiln fired in Cannelton, Indiana, this mammoth 16 1/2" tall eight gallon stonware jar was brushed with dark chocolate brown Albany slip and stenciled with Cannelton's signature mustard slip decoration. 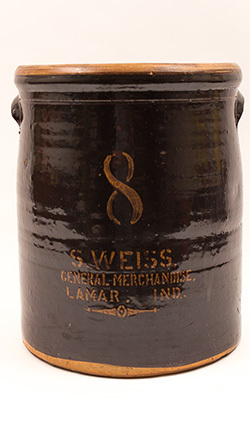 Indiana stoneware expert and collector Dr. Anthony Charles Stringfellow mentioned to us that he hs seen plenty of two gallon Weiss jars but has never seen one in a scarce eight gallon size. Circa 1861-1890: A.P. 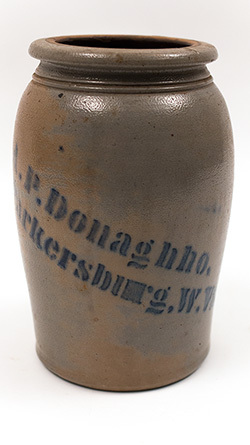 Donaghho, West Virginia's premier potter, was in the pottery business for over three decades, and his output was great, thus testifying to his mastery of the craft and the high quality of the stoneware he produced. 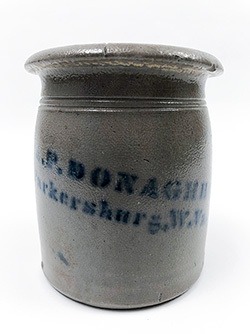 This pleasing 10" one gallon blue decorated storage jar is an excellent example of Donaghho's work. 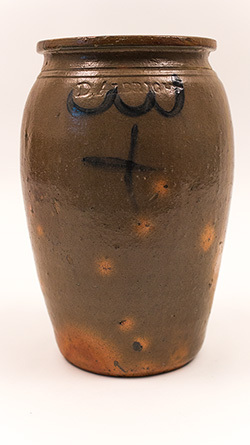 The stencil decoration is clear and dark, and the jar is potted perfectly, comes with no chips, cracks, or repairs, and is sure to please its new owner. 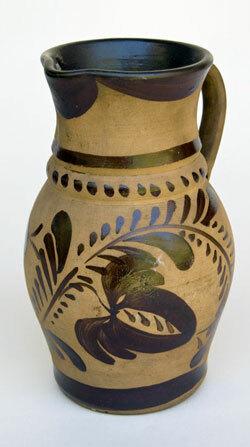 Circa 1880s: This highly unusual Ohio one gallon apple cider jug stands 11" tall and features a rarely seen freehand apple decoration, showing this jug was meant to hold apple cider or apple jack, its fermented cousin. 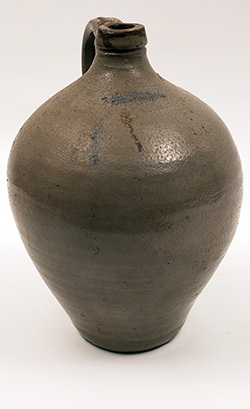 This neat piece of American stoneware has no chips, cracks, or repairs and has only an off center mouth hold from being placed on the bottom row of the kiln during the firing process. 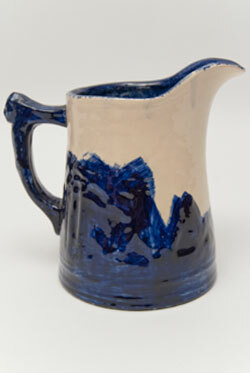 This actually gives the jug a great primitive look and adds to its folksy appeal, making it a wonderful addition to any collection of American folk art pottery, early stoneware, or country antiques. 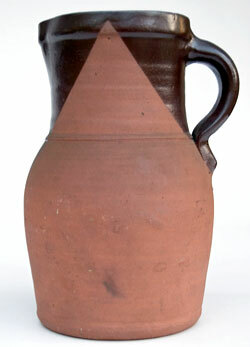 Attributed to Clarkson Croilus, Jr.: This beautifully primitive two gallon ovoid stoneware jug stands nearly 13" tall and is attributed to the Croilus family, most probably Clarkson Croilus, Jr., his celebrated father's namesake. 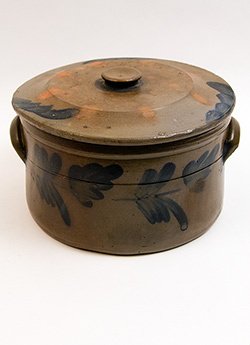 There are no chips, cracks, or repairs on this fine example of early 19th century New York stoneware, and it will fit in perfectly in any collection of antique crockery or antique America country primitives. 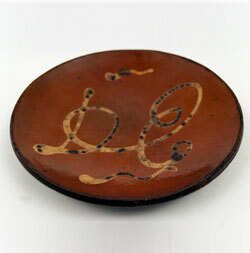 Circa 1820-1850: It is always exciting to find the antique redware in yellow script decoration with letters, names or other readble parts. 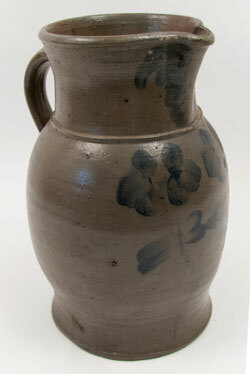 Circa 1850s: This stunning 17" four gallon ovoid jug features a large, skillfully renedred, and highly contrasting leaf, stem, and double flower decoration typical of J. Weaver's pottery in far western Pennsylvania's Beaver County. 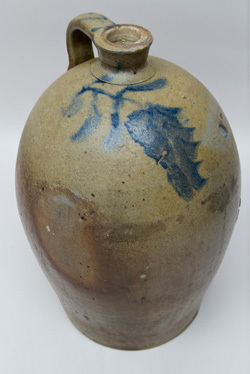 This is a heavy piece of antique American stoneware with a thick but well-crafted handle and beautfully done ovioid form. 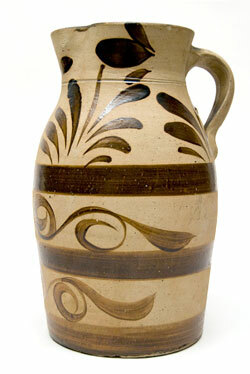 This is a great piece of Pennsylvania stoneware and would be at home even in the most advanced collections. 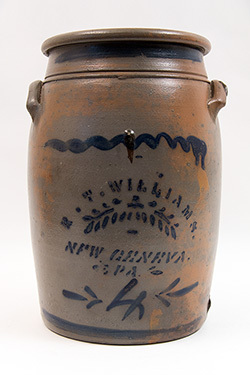 Circa late 1840s - late 1870s: Beaver County, Pennsylvania stoneware cake crocks are hard to find, and this J. Weaver three gallon cake crock is the largest example we have ever seen from the region. Circa 1865-1867: The J. A. 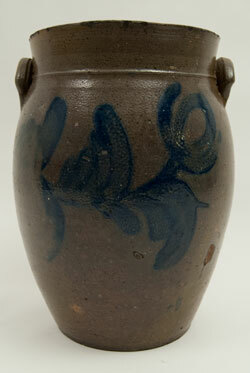 & C. W. Underwood pottery factory was located in Fort Edward, N.Y. from 1865 - 1867. 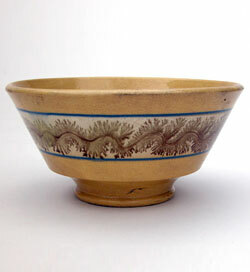 Circa 1820-1840: Brown seaweed dendritic decoration on white ground, outlined by two blue pinstrips on yellowware on wonderful raised foot.